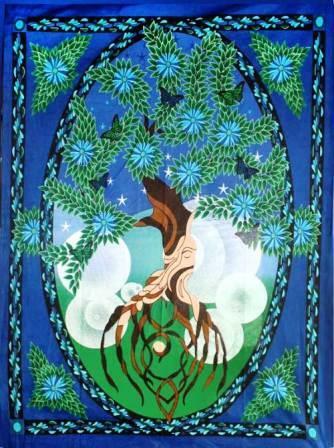 This lovely tapestry features the majestic image of the Tree of Life. Within its branches are delicate blue flowers and butterflies. An elegant black and blue border perfectly frame the image. Each beautiful tapestry is meticulously hand crafted from 100% cotton. Tapestries can be hung on the wall, used as tablecloth, blanket, curtain, or as a focal point for meditation.. This tapestry measures approximately 52" x 76".